“[Art Buchwald] has given his friends, their families, and his audiences so many laughs and so much joy through the years that that alone would be an enduring legacy. But Art has never been just about the quick laugh. 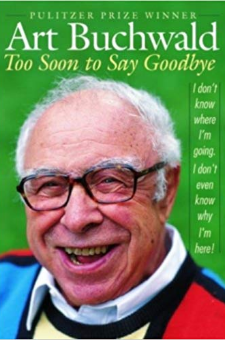 His humor is a road map to essential truths and insights that might otherwise have eluded us.”—Tom BrokawWhen doctors told Art Buchwald that his kidneys were kaput, the renowned humorist declined dialysis and checked into a Washington, D.C., hospice to live out his final days. Months later, “The Man Who Wouldn’t Die” was still there, feeling good, holding court in a nonstop “salon” for his family and dozens of famous friends, and confronting things you usually don’t talk about before you die; he even jokes about them. Here Buchwald shares not only his remarkable experience—as dozens of old pals from Ethel Kennedy to John Glenn to the Queen of Swaziland join the party—but also his whole wonderful life: his first love, an early brush with death in a foxhole on Eniwetok Atoll, his fourteen champagne years in Paris, fame as a columnist syndicated in hundreds of newspapers, and his incarnation as hospice superstar. Buchwald also shares his sorrows: coping with an absent mother, childhood in a foster home, and separation from his wife, Ann. He plans his funeral (with a priest, a rabbi, and Billy Graham, to cover all the bases) and strategizes how to land a big obituary in The New York Times (“Make sure no head of state or Nobel Prize winner dies on the same day”). He describes how he and a few of his famous friends finagled cut-rate burial plots on Martha’s Vineyard and how he acquired a Picasso drawing without really trying. What we have here is a national treasure, the complete Buchwald, uncertain of where the next days or weeks may take him but unfazed by the inevitable, living life to the fullest, with frankness, dignity, and humor.